Plazmaman are an Aussie brand, founded in Sydney in 1988, dedicated to delivering the best high-end cooling and performance solutions to car lovers across the globe! What makes Plazmaman Intercoolers so great? Every Plazmaman part is handcrafted in their warehouse in Sydney where they have a complete manufacturing, fabrication, and finishing facility. They do everything from welding to tube bending to product polishing and powder-coating – nothing is outsourced. With enhanced detailing on every single product, the performance and quality of Plazmaman Intercoolers is not only impressive, but the detailing on the intercooler faces is the most striking in today’s market. 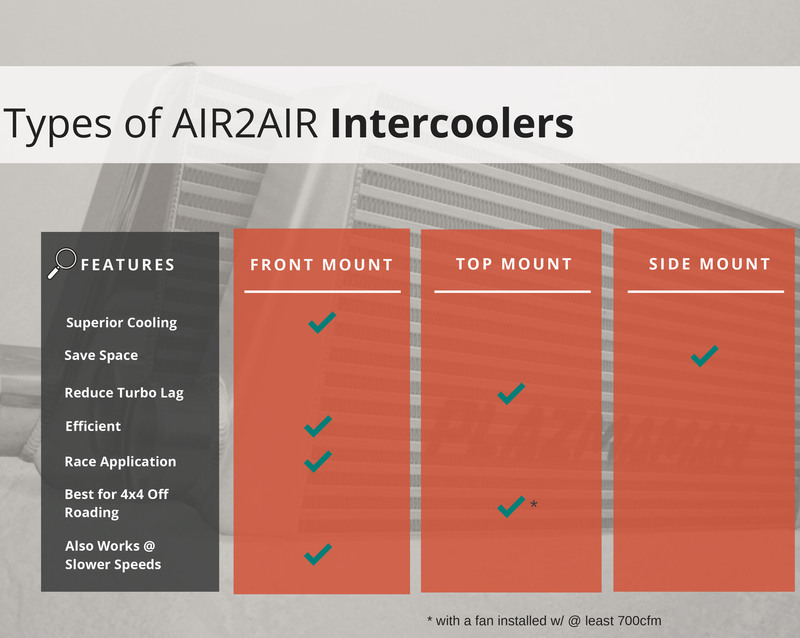 A2A Intercoolers are the most popular type on the market; they are extremely efficient and powerful enough for street and track use for most vehicles. They offer a simple structure and are lighter than A2W intercoolers. A2W intercoolers (which use water or a water/solvent mix) should be your pick if space is an issue and if you require substantial heat exchange for high-performance vehicles – although smaller, note that they require more coolant lines, fittings, a coolant pump, and (sometimes) an additional radiator. Front, Top, or Side Mounting? A front-mounted intercooler is the most common mounting positions due to the superior cooling capabilities it offers, as a larger amount of ambient air can pass over its chambers. If you are trying to reduce turbo lag, you could opt for a top-mounted intercooler – it will, however, receive less external air and lose out on efficiency compared your FMIC. If you are after a smaller, more compact intercooler, you can get a side-mounted model. But, they too are less efficient than a FMIC as they cannot stop air from traveling to the radiator. Bar and Plate or Tube and Fin? Tube-and-fin cores are often the preferred choice of performance enthusiasts, as they are exceptional at channelling ambient air than bar-and-plate cores. Plazmaman intercoolers feature European square tube and fin cores instead of a round shape. The result? Superior cooling and less pressure drop compared to round tube, fin and bar, and plate cores. Ensure the long-term reliability of your heat exchanger and efficient airflow through the core by opting for a well-designed, well-constructed air tank. For optimal performance and durability, choose an aluminium end tank (cast-aluminium is the premium choice, with cut-and-weld coming in second, and stamped third). Plastic end tanks are appropriate for stock vehicles, but failures will occur when the vehicle is modified, or the boost levels increased. Plazmanman end tanks can be completely customised to suit your preferences and vehicle. Plazmaman Intercoolers are not only extremely quality and performance-focused, but offer unchallenged levels of customisation, suiting the most pedantic car enthusiast. You get to choose the kind of outlet you want for the fabricated bottom inlet/outlet tanks and choose from a raw, black, or polished finish for your intercooler – you can even achieve a full-custom design based on your own drawing!